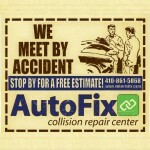 Here at Auto Fix Collision Repair Center customer satisfaction is our number one priority. We have been the quality repair shop of Westminster Md. since March 2012. Our shop is new but that doesn’t mean we are new to the industry, our staff has been in the auto body industry since 1996. Here at Auto Fix we focus on everything from small dent repair to major collision repairs, restoration work and full one-off custom builds. We also provide vinyl signage, vehicle lettering as well as full color digital printed banners and signs. We can meet all your vehicle and advertising needs in house within a few short days, making us Westminster’s One Stop Collision Repair Shop. Auto Fix is a bilingual shop. We speak Spanish and have a sign language interpreter on staff!! Is English your second language and you fluently speak Spanish? Aquí en auto fix hablamos español. Are you hearing impaired or have a loss of speech? We have a Sign Language Interpreter on staff!